The decision to build an airport in Newfoundland was made at an air conference in Ottawa in 1935, when agreement was reached by the governments concerned to permit one British and one American company to undertake experimental flights across the North Atlantic, with a view to the early establishment of regular services. It was hoped that these experimental flights could commence in 1936, using flying boats which were already in operation by the companies and were considered suitable to undertake the flights under experimental conditions. It was realized that land planes would certainly be brought into operation on the North Atlantic with the normal progress of technical development in aircraft; but, at this time, no land planes had been developed suitable for experimental flight. Also, the time taken to develop the necessary airports would be such that it was essential to conduct the early experiments with flying boats, as a flying boat base could be developed on very short notice. Consequently, late in 1935, officials of the British Air Ministry visited Newfoundland selected Botwood as the location of the flying boat base and this present location of Gander (then known as the Newfoundland Airport) for the development of the land plane base. Early in 1936 work commenced in England, Canada and the U.S. to establish the necessary ground services on each side of the Atlantic and in Newfoundland. At the same time, the Eire government came into the picture and establishment commenced of a flying boat base with the necessary wireless and meteorological facilities at Foynes on the River Shannon. The Newfoundland government assumed the responsibility for the development of Botwood and Gander with the assistance, both financial and technical, of the British Air Ministry. Work commenced on the site selected at Mile Post 213 on the Newfoundland Railway in June 1936. In August 1935, a technical representative of the Air Ministry arrived in Newfoundland with the primary objective of developing Botwood as a flying boat base and to install radio facilities for the forthcoming experimental flights. In the meantime, the Canadian government, who had assumed responsibility for the meteorological services, had gathered the nucleus of a forecasting staff and commenced training in the specialized work for the Atlantic. This staff eventually arrived in Botwood in June 1937 ready for the first experimental flight. The Botwood radio station was ready for operation in January 1937 with facilities for direct communication across the Atlantic and for aircraft, together with the necessary navigational assistance in the form of medium and high frequency direction finding. The first members of the radio staff from the Air Ministry arrived at Botwood and commencement was made in recruiting a radio staff of Newfoundland operators. Little work was carried out at Gander during the winter of 1935-37, chiefly due to the fact that winter work was uneconomical. 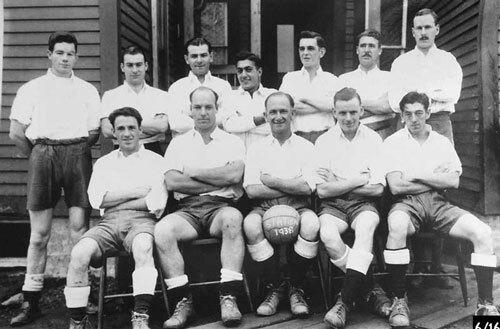 However, by the end of the summer season of 1936, considerable progress had been made. The working strength had risen to 500 and the acquisition of a large quantity of grading equipment had effected a surprising change in the forest and there were definite signs of the formation of the runways. In the spring of 1937, there was considerable activity at both Botwood and Gander. The working force at Gander was increased to 900 and Botwood was ready to operate the experimental flights. The first commercial Atlantic flight was completed July 5, 1937 when, on a simultaneous crossing, the Pan American Clipper left Botwood and the Imperial Airways Caledonia left Foynes. The success of these two flights and those which followed in 1937 was a happy augury for the future. By 1938 there were signs that there might be land planes ready for the experimental services. 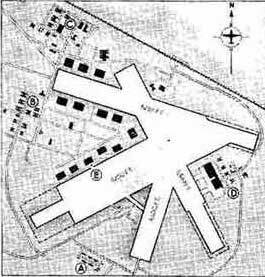 To this end, work was pushed ahead at Gander in order to have at last the full length of runways available together with a hangar, however, technical developments of the land planes on both sides of the Atlantic did not fulfill expectations and the runways still remained unused. During 1938 it was realized that the main traffic across the Atlantic would be carried out by land planes and the need for the permanent Atlantic wireless organization at Gander. Thus, on completion of the flying boat season at Botwood in 1938, control, radio and meteorological organizations, which by this time had reached a strength of about 50, moved over to Gander. It can be taken that this date, November 30, 1938, marks the actual bringing of Gander into the world as an operation station. However, communications with the outside world showed no break and, when the key was lifted at Botwood for the last time, Gander was ready to take over. With the advent of spring 1939, the end of the project was well in hand. There remained the paving of the full width of the runways and completion of the drainage. The airport could be considered ready for operation but there still remained the lack of suitable aircraft for Atlantic flights. During the summer season, flying operation did commence with the arrival of two refueling aircraft which were used throughout the summer of 1939 to refuel in the air all Imperial Airways flying boats leaving Botwood on the eastbound crossing. By the outbreak of war in September 1939, Gander was complete and was ready for civil operation. The cost, which had given so much trouble in peacetime, was forgotten. The value of a fully complete airport in such a strategic position could not be assessed, particularly, when one realizes that, at that time, Gander was the only operative airport in Newfoundland or in the Maritimes. It appeared that commercial operation on the Atlantic would be suspended, but the civil staff waited – not knowing what the military developments would be, however, as a civil operation, during the winter of 1939, experiments were carried out to test the possibility of operating on wheels under winter conditions. These experiments had most valuable results as, in the following winter; delivery of military aircraft to Great Britain was commenced using the original civil organization. During the winter of 1939-40, when experiments were being carried out on the runways, sufficient confidence was obtained to give agreement to a visit of RCAF planes on a survey flight, thus, the first RCAF aircraft and personnel to arrive at Gander was the occasion of a short visit of two Hudson aircraft on February 10, 1940. The first detachment for duty arrived some months later. At that time, the airport was still under the control of the civil organization and the detachment of officers and men were accommodated with the civilian resident staff in the only building available at that time – the old Administration Building and Construction Engineers’ Mess. On November 9, 1940 the first formation of bombers for Britain, made in the United States, set out from Gander and reached England the following morning. This demonstrated the feasibility of delivery by air and shortly afterwards Gander became the scene of regular flights of these aircraft – manned by men of all nationalities. These flight deliveries were organized by ATFERO – Atlantic Ferry Organization (later RAF Transport Command) which the RAF set up at Gander as a unit to handle the increasing flow of bombers in 1941. Up to this date, control and signals were handled by the Newfoundland staff and weather forecasting by Canadian staff. Not until 1941 did the RCAF take over the functions of the Newfoundland staff. It is not generally known that the Newfoundland staff played such an important part in the early days of bomber deliveries. In 1942 the Newfoundland Government handed over control of the Newfoundland Airport (Gander) to the Canadian government and it became a mighty military airfield. The RAF continued as a separate unit and, when the United States entered the War, their planes and solders came in to use the field, the base being an RCAF Station. There was a continuous delivery of planes and many thousands dropped down at Gander on their way to the war zone. At the end of the war, the Newfoundland Government resume control of Gander from the Canadian Government. In the meantime, as from October 1945, Pan American, American Overseas Airlines and Trans World Airlines had carried out preliminary flights via Gander and, by the end of the year, had established regular Atlantic passenger services by way of Gander. When the Newfoundland government took over again, this passenger traffic was already assuming large proportions and the Government was faced with the problem of meeting increased passenger accommodation in the shape of rest rooms, hotels, etc. The first concern, therefore, was to arrange temporary passenger accommodation. A hangar was used as a waiting room and accommodations were found in a converted military barracks. A lounge and dining room was created out of a NCOs’ mess. Ultimately, a passenger terminal was built in a portion of an existing RAF hangar. This was officially opened on September 14, 1946. Because of its strategic location in Northeastern Newfoundland, Gander has been a main refueling base for transatlantic flights operating between Europe and North America, ever since it was completed in 1939. A logical “half-way house” for the inter-hemispherical air traveler, It is 1021 miles from Canada’s capital, Ottawa; 1100 miles from New York and 1981 miles from Shannon, Ireland. It serves as the Eastern Terminal for the vast and efficient system of controlled Canadian airways, maintained by the Ministry of Transport and extending from the Atlantic to the Pacific and northward into the Arctic. The airport’s facilities have kept pace with the great forward strides being made by aviation. Gander’s first air terminal housed the Administration Building, along with departments of the former Government of Newfoundland. It was then decided to take over an old hangar for use as a Terminal. Still later, a combination hangar-garage, used by the wartime Ferry Command, was converted into an International Terminal and an adjoining mess hall was made into a Domestic Terminal. By 1954, it became apparent that a new terminal must be erected to handle an estimated 13,000 aircraft a year and the quarter million or more passengers aboard them. The Ministry of Transport built a new Terminal to meet all anticipated requirements for many years into the future. The most modern of facilities were incorporated in the structure, to provide airline operators with the newest and best in aerial navigation and safety aids, and the air traveler with pleasantly efficient and comfortable accommodations to meet all his requirements. Special emphasis was placed on the needs of passengers arriving from overseas points, from the standpoint of Customs, Health and other documentary processing. It was built at a cost of just over $3,000,000 and is fitted with the finest of equipment for the requirements of jet age aviation and the jet age air traveler. It was designed to meet the special needs of an airport serving, to a major extent, international aviation. One of its principal features is the large international waiting room in which the travel0tired airplane passenger can stretch his legs and relax during stopovers without having to go through full “entry into Canada” formalities. International passengers enter by way of one of five gates located along the length of a two-story “finger” projecting from the building. To return to their aircraft, they ascend to the upper level by means of an escalator and proceed along the “finger” down to the appropriate gate position. The “finger” is so designed that it can be increased in length, should the number of flights into Gander demand more gate positions. All other parts of the building are also designed so they can be expanded without affecting the round-the-clock operation of the Terminal. The Information Booth is manned by a bilingual staff prepared to give travelers information about Canada or Newfoundland at any hour. 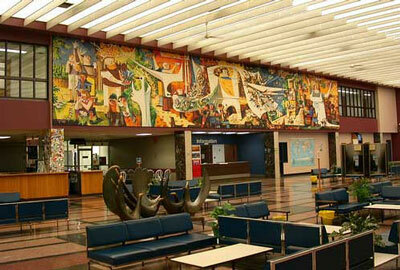 Of particular note in the International Waiting Area is the 69 foot long mural, 12 feet high, by Canadian artist Kenneth Lochhead of Regina and the “Welcoming Birds,” a striking sculptured group in bronze by Ottawa artist, Arthur Price. Mr. Lochead’s work is based upon the general theme “The Air.” Mr. Price’s figures, standing four feet high on a bronze base eight feet long, represent the welcome accorded by Canada to air travelers from abroad. Health Department, Immigration and Customs offices are so located that the transatlantic air traveler can be cleared quickly through the health check-up and customs inspection and admitted to the International Waiting Room. Should he move, however, into the Air Terminal’s other seas, he has to do so through full formal procedure for “entering Canada.” Similarly, anyone going from these areas into the International Waiting Room has to go through official “leaving Canada” formalities. The Health and Welfare Department’s inspection services at Gander for transatlantic air passengers are carried out under a reciprocal arrangement with the United States government and are valid for persons continuing directly to points in the United States. Coupled with the Air Terminal’s operations are complete facilities for servicing aircraft, including an underground “hydrant” system for high speed refueling of aircraft. The Air Terminal Building was built by Kenny Construction Company Limited and the architects were Durnford, Bolton, Chadwick and Ellwood of Montreal. The runways at Gander underwent extensive changes. One was extended by the Ministry of Transport from its original 5000 foot length to 8600 feet; one at 6000 feet long was left at its original length and one new one built, 8200 feet long. Still another, one of the original runways, was abandoned because its location did not permit necessary extension. All runways were strengthened extensively to handle the increasingly heavy types of aircraft that were being put into use on transatlantic runs. Taxi strips were also built to serve the two main runways and speed up the handling of traffic. When the aircraft first went into operation, runway lighting was provided with power from a battery system. This was replaced by the latest type of high intensity lighting to provide the best possible night visibility for pilots. 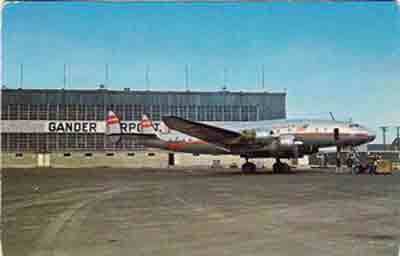 Improvements of the airport facilities at Gander since 1949 has been an unending project. The task will continue for, as the aviation scene changes, so must the operations at Gander change to meet new requirements.